Scottsdale is a place of extremes—that’s why I love it so much. I can shop in cosmopolitan stores, enjoy fine dining, luxuriate in spas or hike the wilderness of the Sonoran Desert. As you wander Scottsdale, you’ll notice beautiful mountains surround us. Just over the city’s eastern border, past the town of Fountain Hills, are the majestic Matatzal Mountains, dominated by Four Peaks. I was thrilled and surprised to discover, after 25 years of living here, that Four Peaks Amethyst Mine sits high up on its namesake peaks. What’s even more shocking is that you can visit the mine (albeit only twice a year) via helicopter, creating an unforgettable experience. Four Peaks Amethyst Mine offers some of the most sought-after gemstones in the world. Arizona is one of only two places that produce this dark purple, gem-quality amethyst. The other is in Russia’s Ural Mountains. Historians can trace the first use of Arizona’s amethyst to Spain’s crown jewels, carried back to Europe by the earliest explorers. 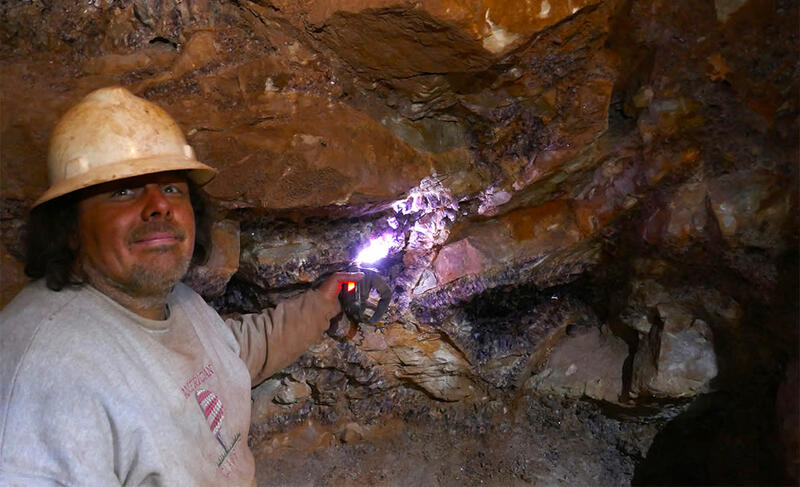 The amethyst mine went largely unknown until the early 1900s when a curmudgeonly miner—Diamond Jim—uncovered the vein. While he was disappointed he didn’t find diamonds, generations have been thrilled with the gorgeous purple stones. 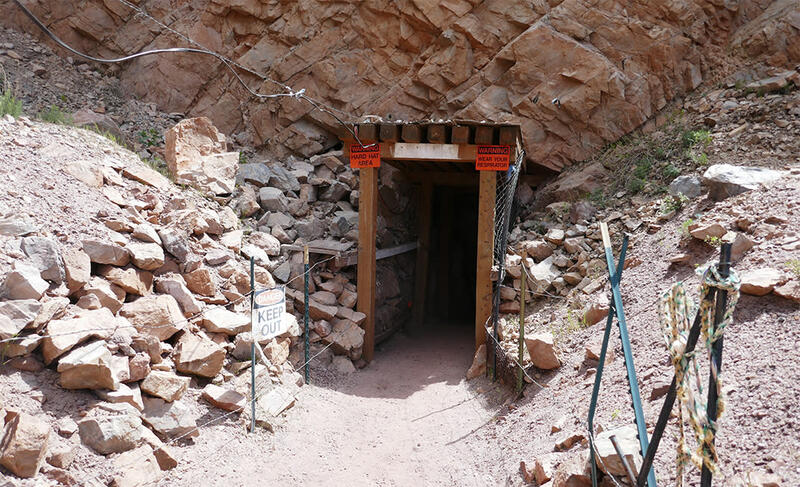 Back in Diamond Jim’s day, the only way in or out of the mine, which sits at 7,200 feet above sea level on a rugged mountainside, was on foot or by pack mule. Commercial mining began in 1942, but there were always challenges because of the remote location. In 1997, New Jersey businessman Kurt Cavano joked at the Tucson gem show that he wanted to buy his own mine. It wasn’t long before Cavano became the new owner of the Four Peaks Mining Company. Today, Cavano and his wife operate the mine and, in much the same way as in Diamond Jim’s time, there aren’t a lot of options for getting in and out. Miner Mike and his wife work for the Cavanos and hike in once a month. The couple lives there without electricity or running water and mines the amethyst with only hand tools. Fortunately, for those of us who want to see the mine, Cavano uses helicopters twice a year to carry in supplies and bring the amethyst out, so you can hitch a ride to explore the mine. Visiting the mine was a thrill for me and I could tell that others on my tour were just as giddy. Guests can book a tour for either April or September/October (private tours are also available). You start the adventure from Sami Fine Jewelry in Fountain Hills, giving you a chance to check out the finished product while you wait for the tour to start. On the short drive to the helicopter landing pad, we learned everything we ever wanted to know about amethyst. I was shocked to learn that for every ton of ore mined each year, the end result is only a few handfuls of quality gems. Everyone loaded onto the helicopter and off we went. It’s such a different experience to see a place from the air. We moved along the valley and Four Peaks loomed ahead of us. I tried to figure out where we were landing when suddenly we touched down on this tiny spot on the side of the rugged mountain. 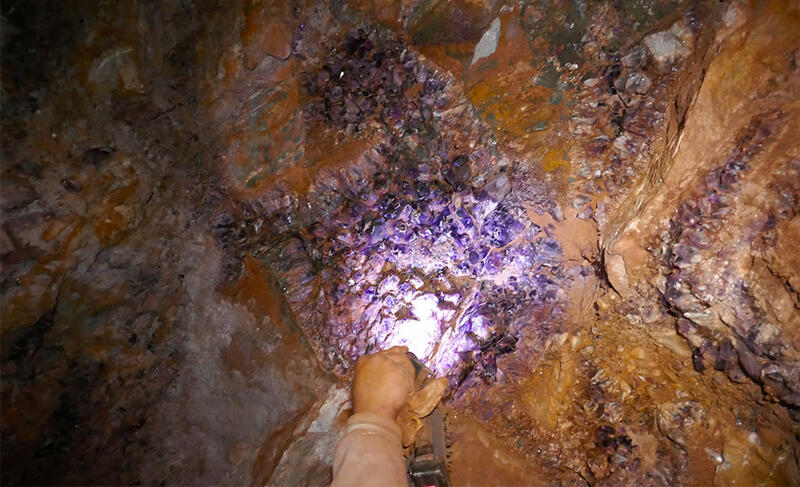 After donning a hardhat and being handed a screwdriver and flashlight, visitors get a chance to go inside the mine and look for amethyst treasures. We followed Miner Mike, who showed us the best places to dig for treasures. The five us filled our little plastic bags with what appeared to be dirty rocks but when you hold them up to the light, they shimmer a brilliant purple. After exploring inside, we wandered around the entrance picking up more shards outside. The ground literally glitters purple and there we all were, bent over collecting rocks like children looking for shells at the seashore—except we were more than 7,000 feet above Scottsdale on the side of a mountain. As the helicopter took off from the landing pad to take us back down the mountain, I looked out across the desert. So many treasures hidden in this wild desert I call home! Somehow the prized and rare amethyst vein that runs through the mountain symbolizes the hardy vein that defines the spirit of Arizona. Susan Lanier-Graham has been living in Arizona for more than 20 years. She is a freelance food, wine and travel writer who wanders the world in search of "wow moments." She finds many of them right here at home. You can find more of her travels at www.wanderwithwonder.com.